ABC, CBS, FOX and NBC continue their grip on the top four positions on the list of top 10 TV brands that American consumers consider “Must Keep TV.” It’s a close race for #1 with ABC posting just a slight lead over CBS overall in 2013. ESPN is once again the top cable brand for American viewers and holds the number five spot overall for the fifth year in a row. There has been some shifting in the ranks with History moving up to sixth place, eclipsing seventh place Discovery for the first time as the top non-sports cable brand since 2007. HBO has rejoined the top 10 after two years outside the top echelon. 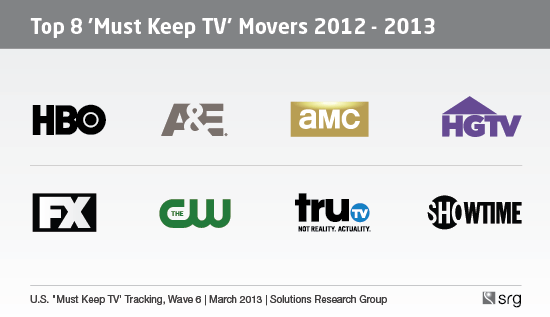 That leaves USA and PBS to round out the top 10 in SRG’s latest “Must Keep TV” report. The sixth edition of the independent tracking survey is based on interviews with 1,400 American consumers aged 12-plus in Spring 2013. Their evaluations of 74 selected network and cable brands reveal which brands consumers must have, the ones gaining in popularity and those that are slipping. Original programming such as Game of Thrones and Girls has paid off for HBO which has climbed to the #8 spot from #11 last year and #13 in 2011. A&E has landed at #11, up from #16, thanks to popular titles like Duck Dynasty and Storage Wars. Syfy has quite fittingly settled into the #13 slot for the second year in a row, and has been a fixture in the top 15 for all six years of the study. Comedy Central hangs on to #14 and TBS remains at #15. Home of Walking Dead and Mad Men, AMC, continues its epic climb up the chart landing at #18 from #33 in the Total 12+ rankings, a significant jump from its #46 standing just in 2011. HGTV is another cable brand to watch. It showed increases across all key demos. MTV lost its luster with 18-34s and has dropped out of its top 20 list, while HBO, USA, AMC, CW and FX all nabbed big gains in the demo. While the big four are ranked at the top of the brand lists for the sixth year in a row, the proportion of Americans who would include at least one of the big four networks on their ‘must keep’ list was only 75% this year. While this is still a big number, it’s down 8-points from a peak of 83% when we first started tracking in 2007.